Pour boiling water over butter, sugar and salt. Add milk. Let stand until warm. Dissolve yeast in warm water. Add to milk mixture with the beaten egg. Stir in 2 cups flour. Beat. Add enough flour to make a soft dough. Cover with waxed paper and a cloth; chill until ready to use. Roll dough to 1/4 inch thickness. Do not let dough rise before frying. Cut into squares and fry a few at a time in deep hot fat at 360 degrees. Brown; turn and brown on other side. Drain; sprinkle with powdered sugar. In a medium saucepan over low heat, slowly reduce the balsamic vinegar by 50%. You should have 1/2 cup. Allow to cool to room temperature which will thicken it further. 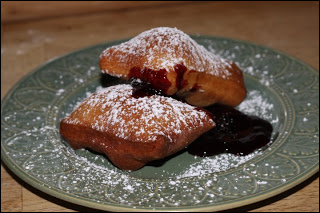 Serve with warm beignets.